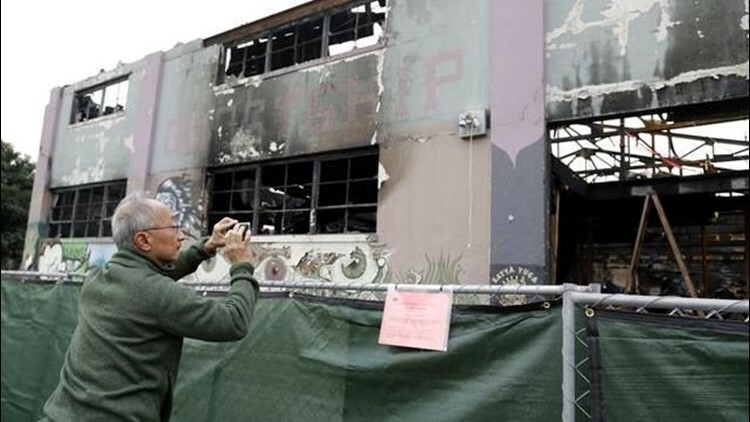 OAKLAND, Calif. (AP) — Lawyers for two men charged with involuntary manslaughter in connection with an Oakland warehouse fire that killed 36 partygoers said Friday that they will try to get their clients released from jail on lower bail. Derick Almena, 47, and Max Harris, 27, were being held on bail of a little more than $1 million each after their arrests last month on 36 counts of involuntary manslaughter. Their lawyers said after a brief court hearing that both men should have their bail amount significantly reduced. "He is not a flight risk and he certainly isn't going to reoffend," said Tony Serra, a lawyer for Almena. Harris' attorney, Curtis Briggs, said, "There is no legal reason for Mr. Harris to be in custody." Almena and Harris were scheduled to enter pleas, but the judge agreed with their lawyers to delay their arraignment to Aug. 4. The defense says the men are waiting for prosecutors to turn over more evidence. The defense lawyers will formally argue for reduced bail later this month. Prosecutors declined to comment after the five-minute hearing. Mary Alexander, a lawyer for the families of a dozen victims, said they oppose the men's release. "The families are very pleased that criminal charges have been brought against Almena and Harris," Alexander said outside court. "These people created a death trap." Visitors and tenants alike described the so-called Ghost Ship warehouse as a warren of scrap wood, sofas, old pianos and snaking electrical cables. Several said Almena, who rented the building, brushed them off when they voiced concerns. Oakland firefighters say they may never determine the cause of the Dec. 2 fire because the damage to the building was so extensive. Investigators looked into an electrical cause. Almena rented the warehouse and lived there with his family. Harris also lived in the building and helped Almena book musical acts and sublet the space to artists looking for affordable housing. The defendants' lawyers say their clients are being scapegoated for the region's housing crisis. The lawyers said the Pacific Gas & Electric utility and firefighters are also responsible for the fire. PG&E spokeswoman Tamar Sarkissian said the utility found no evidence its equipment contributed to the fire and that it received no reports of electrical trouble at the warehouse. Oakland Mayor Libby Schaaf defended the firefighters' response and said the defense attorneys are seeking to shift blame from their clients.